Despite my jovial manner, I'm not a kid, nor did I attend the screening of MegaMind with one. While you would've thought I would be out of place and looking a little creepy, the movie surprisingly made me feel right at home, making me realize I was seeing an adult movie cleverly disguised, much like one of MegaMinds disguises, as a child's movie. The movie takes many very familiar elements from movies like Superman and adds in a lot of pop culture elements, the voices of Will Farrell, Brad Pitt, Tina Fey, Jonah Hill and David Cross and creates a fun story, albeit a slightly complicated one for the younger audience. The idea is that Farrell's MegaMind and Pitt's MetroMan are sent to earth from a dieing world into separate places. 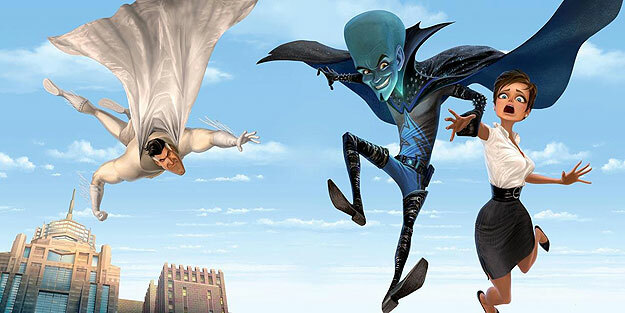 Megamind lands in a jail and takes the part of villain to MetroMan's hero. Once MetroMan is gone, in a slightly disturbing death scene, Megamind realizes he no longer has a challenge, so he creates a new hero, from a lonely camera guy, played by Jonah Hill, only to realize his creation is a terrible villain. Now, the once great super villain must put on the cape and be a hero, with the help of a journalist and love interest, voiced by Tina Fey. I saw the movie in 3-D and was blown away by how good it looked. Sure, there were some gimmicky shots like spiders and popcorn being dangled in front of the audience, but the movie did a really good job of keeping the effects subtle and beautiful. The little things like the hair on MetroMan's head, or the water surrounding MetroCity, or the building landscapes all looked crisp and clear and stood out with the 3-D glasses. The soundtrack was the best part, however, with an extremely lively selection of songs by the likes of AC/DC and Michael Jackson to name a few. The songs really added to the story, and every time MegaMind made a flashy entrance, the music only added to the enjoyment. The characters were extremely cliched, but it was part of the slightly different take on the genre the movie used. In the movie, we weren't cheering for the perfect, Superman-esque hero, or the lonley, pathetic dork-turned Superman, we were cheering for the evil super-genuise who only wanted to win one battle, and be the one to get the girl. The eventual role reversals were really interesting and quite different as we see the villain reluctantly be forced into the role of hero. While I truly enjoyed the movie, I was left wondering if some of the more complex plot points were wasted on my tiny friends watching the movie with me. While I couldn't seem to tell if they got it, I can say the audience was completely silent for the entire hour and a half of the movie, which probably says something right there. Megamind is a very entertaining movie for the whole family, and one you shouldn't feel uncomfortable going to, no matter your age.